In this photo of the Centre Island beach in about 1933, the man on the right is following the law, but the gentleman on the left is in danger of arrest. City of Toronto Archives, Fonds 1244, Item 6049. “Guilty or not guilty?” Magistrate Tinker asked in police court on July 3, 1936. “Guilty,” replied the accused, John McConvey. McConvey was the first to appear before the magistrate, but twenty-three other men were packed into the tiny police court, each arrested for indecent exposure at Kew Beach, Sunnyside, the Islands, and other city beaches, and awaiting their turn in the docket. It was at this point, with McConvey’s conviction all but assured, that a young man glided through the courtroom crowd and whispered in the defendant’s ear. Although the two did not know each other, Ken Blair, a young law student—as he announced himself to the court—offered to act as McConvey’s defense counsel. He set immediately to work, acutely aware of the specific wording of the bylaw. “At the time of your arrest were you bathing, swimming, or washing the person in Lake Ontario?” Blair asked. “Well, your Worship,” Blair turned to the magistrate, “I don’t think the charge is properly laid under this by-law.” Nor was Constable Weller able to confirm that he’d seen the defendant swimming. “Case dismissed,” Tinker concluded. Blair found a loophole in the specific wording of the bylaw, which required a suit that decently covered the body when swimming but not sunbathing. The charges against all other similar offenders were dismissed or withdrawn. Monday on the beach at the foot of Leslie Street, August 12, 1935. City of Toronto Archives, Fonds 200, Series 372, Subseries 41, Item 385. 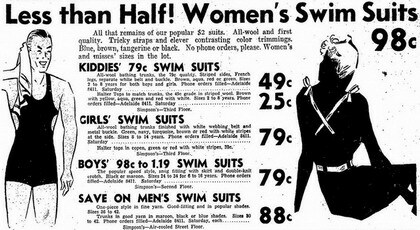 In July 1930, Toronto’s city council amended a previous bathing suit bylaw, which had required all swimsuits cover the bather’s body from neck to knees. The new regulation ruled that a proper bathing costume must cover the body sufficiently to avoid indecent exposure. That is, even men needed a top half to cover their torso. Bathing trunks alone were not enough on the city’s public beaches. Although more liberal than previous laws, this bylaw also soon proved grating. Bathing suit manufacturers contacted the police commission for judgment about whether their products would be considered “proper” by authorities. 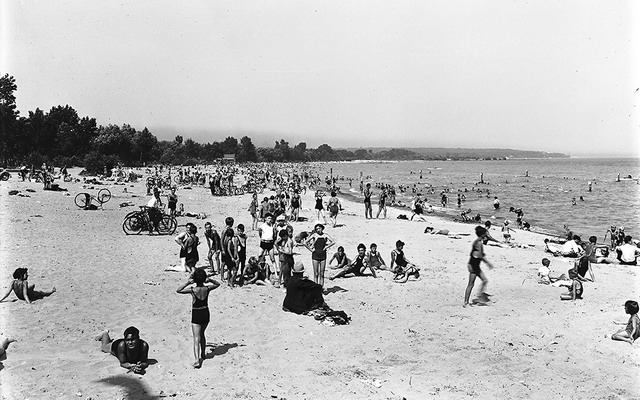 A crowd at Sunnyside Beach, 1940s. City of Toronto Archives, Fonds 1257, Series 1057, Item 91. In response to media inquiries, however, Magistrate R. J. Browne said that they wouldn’t be able to define what was “decent” or “proper” until the court was presented with an individual case, but he hoped that both swimmers and police would show common sense. He was more anxious about the impact of another portion of the bylaw, which forbade wearing a bathing suit on a roadway or beyond the vicinity of a public beach. There was the danger, he worried, that bathers walking along the boardwalk at Sunnyside in their swimsuits might be cited. In mid-July 1936, a letter-writer told The Star that Police Chief Dennis Draper and Inspector Thomas Sockett, the chief morality officer, had made Toronto a laughing stock, criticizing the bylaw as part of a larger municipal apparatus censoring legitimate plays and breaking up political meetings. The letter-writer asked, “How much police dictatorship is Toronto prepared to tolerate?” Although other cities like Hamilton and Georgetown might have similar laws, the letter writer drew attention to Vancouver, where throngs of shirtless men packed the public beaches. Furthermore, he hoped that Torontonians might turn out to the beach en masse on an appointed day, with all the men removing the top piece of their bathing suits at an appointed hour to flout the bylaw and teach the authorities a lesson. In the wake of McConvey’s case being dismissed—along with dozens of additional cases—civic officials admitted that the bylaw as written had loopholes. But, Sockett promised, arrests would continue wherever officers saw an immodestly attired individual in the water—even if they’d only submerged a single foot. Newspaper reporters pestered officials with questions, challenging the assumption that what constituted “decency” was self-evident. “What do you mean—proper?” they asked. “A proper bathing suit is one that prevents indecent exposure,” Tinker responded. 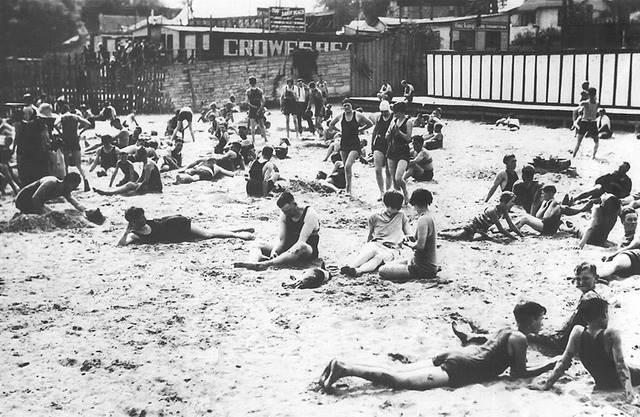 Crowes Beach, Humber Bay, circa 1926. City of Toronto Archives, Fonds 1244, Item 157A. 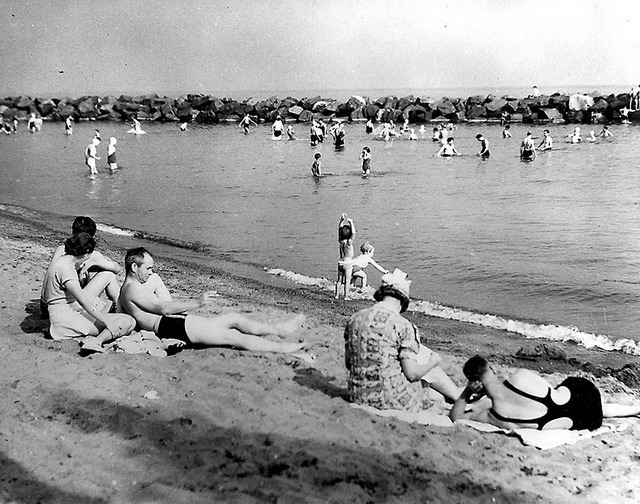 Mayor Samuel McBride seemed apologetic that city council’s bylaw had proven so ineffective, but he and other local politicians endorsed its attempt at regulating modesty on the public beaches. “In my opinion,” he stated from a hospital bed, “the by-law is not properly worded nor logical. You could drive a horse and wagon through it.” But city council was on summer break and nothing could be done to strengthen the bylaw until at least September, despite Sockett’s stated aspiration that the bylaw would be quickly amended to include the shoreline. As July wore on, however, the sweltering heat wave intensified. At times, the mercury hit 105 degrees in an era before municipally designated cool-down centres became the norm. “With little relief in sight,” The Star reported, “Toronto gasped and sagged and limped as the weather got hotter and hotter.” The heat wave culminated with seven deaths in the city in a three day span in mid-July. Simpson’s Ad. Toronto Star July 10, 1936. Offices closed early. Residents of Chinatown tilted back in their chairs out on the street, fanning themselves slowly. The roadways around Sunnyside and the Humber were jammed with cars haphazardly parked as their drivers ran into the water, tearing off their clothes to reveal bathing suits beneath. Temperatures remained high into the night. In the West End, people hunkered down to sleep on their lawns, or on the cool concrete of Queen’s Park monuments. Thousands of others—”with blankets and pillows, and some with towels to keep the dew off”—slept in parks or on the cool shores of the lake. 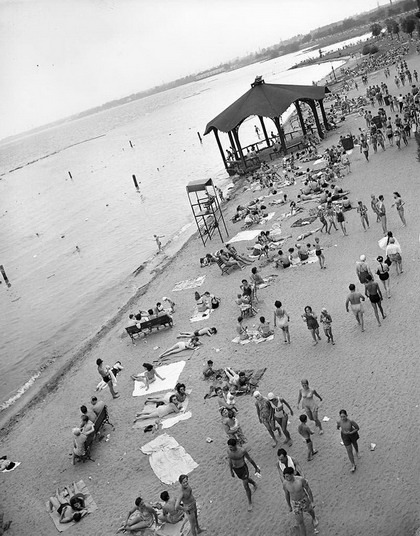 Lifeguard William Appleton estimated a crowd of ten to fifteen thousand at Kew Beach, from the youngest children to grandparents, in all manner of bathing costumes. There were, he admitted, a large number of men with only trunks on. Sources consulted: The Globe, May 30, July 4 and August 14, 1936; The Star, May 29, June 5, June 13, July 4, and July 10, 1936, and June 9, 1937. Did you like this article? Do you love Torontoist? Support articles like this by becoming a Torontoist subscriber. Get great perks and fund local journalism that makes a difference—join Raccoon Nation now.